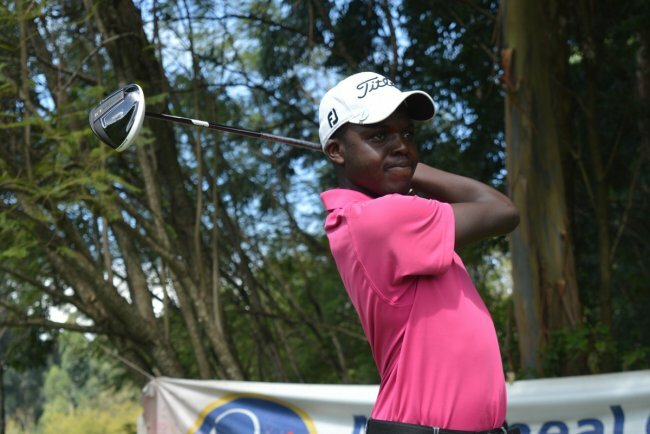 Edwin Mudanyi started well in a GOTY competition at Eldoret Golf Club. Amateur golfer Edwin Mudanyi returned to his former Eldoret golf club with a good start on the opening day of the Manchester salver golf tournament. The former caddie at the club, leveled the par at the par 71 golf course in the Mediheal sponsored golf day during the penultimate Golfer of the year (Goty) organized by Kenya Golf Union (KGU). The Vet la- based golfer played par 71 on the first day that saw him automatically qualify for Sunday’s final day where top 50 golfers will be seeded to accumulate points ahead of Kenya Open. The young brother to South Africa based golfer Nelson Mudanyi, played one over 36 in the first nine and returned with one under 34 to tally his points to 71. He led Royal club's Kennedy Bollo with two shots for second place with two over 73. Bollo shot five over 39 in the first nine and one under 34 in the second before Limuru’s John Kariuki completed the podium with five over ahead of Green Park’s Justus Madoya on count backs for fourth place. Kariuki scored 38 and 36 in each nine while Madoya registered identical 37 in each nine. Nandi Bears golfer Robert Kahega was in 5th with four over 75 to beat Kenya’s number one amateur golfer John Karichu to sixth with six over 77 beating D. Saikwa, Eldoret’s K. Kimosop, former captain Anand Lakhan and Neelesh Aggarwal on count backs.